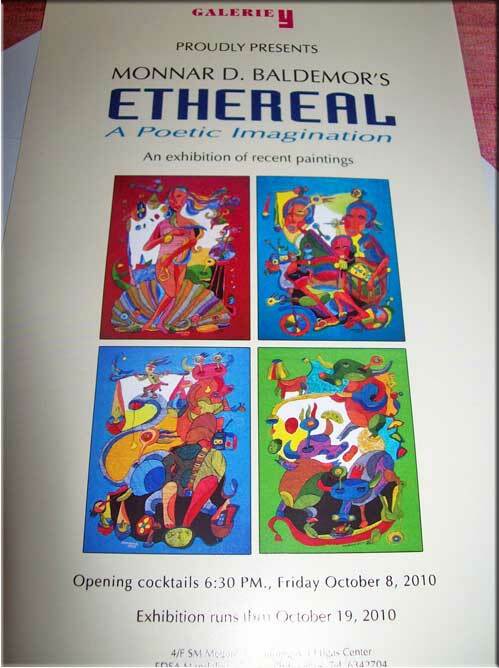 Visual artist Monnar D. Baldemor will have his sixth solo painting exhibit at the Gallery Y, SM Megamall on Friday. Baldemor is the son of prolific and internationally famous painter Manuel D. Baldemor (fineartamerica.com). We got an invitation and we are looking forward to attend the event. My daughter is excited to meet Monnar in person. 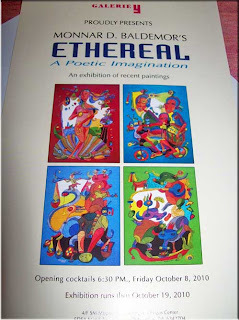 This entry was posted in Uncategorized and tagged art exhibit, art galery, Manuel D. Baldemor, Monnar D. Baldemor, Monnar D. Baldemor 6th solo exhibit, visual artist on October 6, 2010 by Yami. Mommy, ang gaganda na ng mga gawa ni Mumay… pde na ring ipang exhibit. Galing-galing!